The wonderful thing about December is that it’s the month when we begin the steady climb back to eternally sunny days. First, we must endure the resolute descent into the darkest nights of winter, but once the winter solstice has passed, it’s amazing how quickly the days seem to get a bit lighter. Officially, winter is only 10 days old today, but we’re already over the hump of the dark days. At least we are over it in Yellowknife; places farther north don’t see the sun at all, so I quite understand the need for celebration when it returns. Perhaps it was partially to compensate for the lack of natural light that man-made Christmas lights were invented. 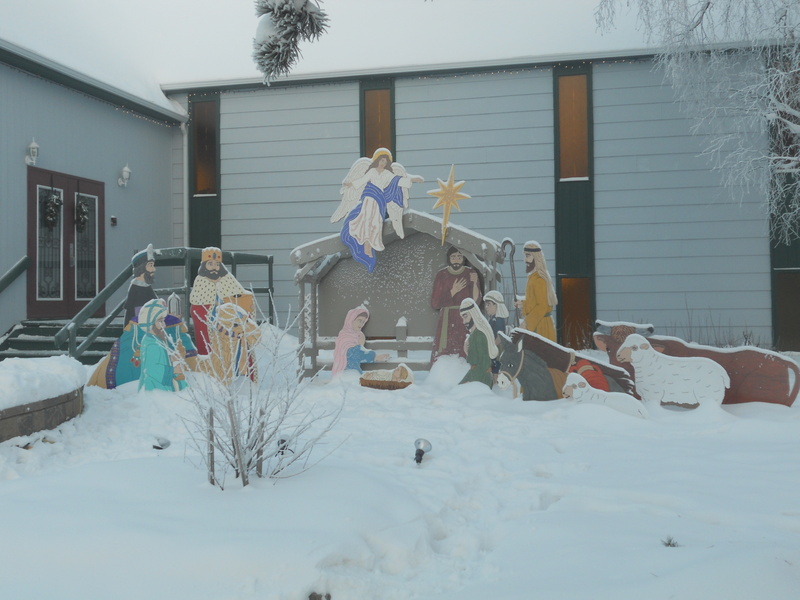 Yellowknifers take their Christmas decorations very seriously. There’s a city-wide competition for the best display of Christmas lights, and many residents drive around town to take in the various entries. 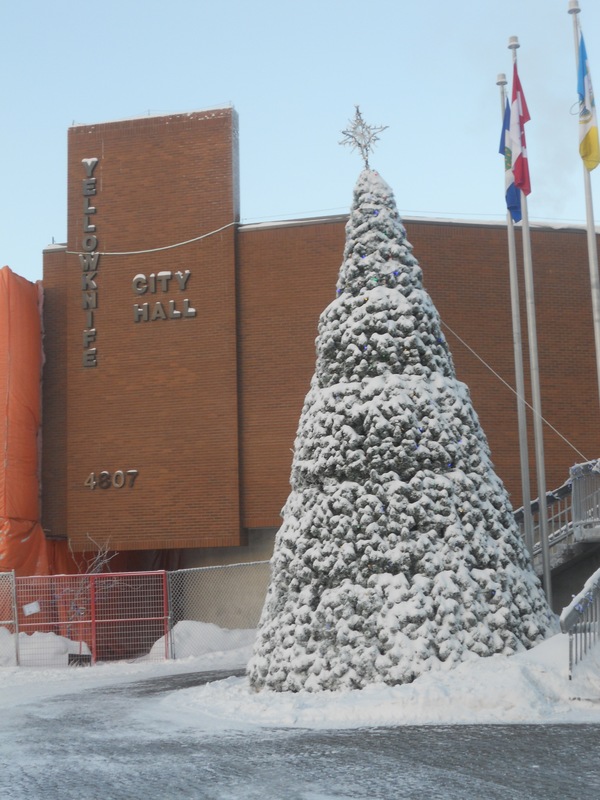 A giant Christmas tree at City Hall is lit in early December with great fanfare, after which citizens are invited to mosey over to the Legislature building (fondly referred to as “the Ledge”) to enjoy some refreshments and good cheer. I tried taking a picture of the tree at night, but the ice crystals in the air dominated the photo, and it was too cold and too dark for me to figure out how to turn off the flash. So this a daytime shot. There are lights under the snow and the tree looks even nicer at night; just take my word for it. Also this month, the churches display their nativity scenes. I think that baby Jesus should be dressed in more appropriate, northern apparel. 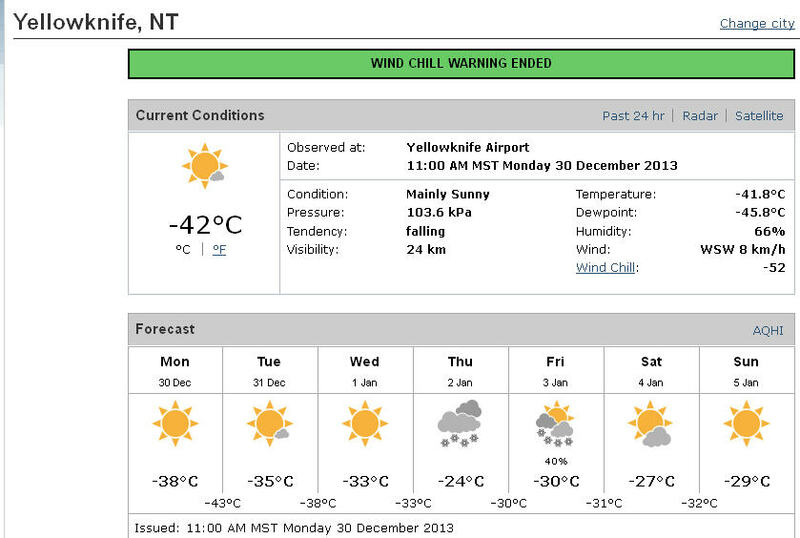 Having to lie outside during December in Yellowknife, dressed only in swaddling clothes, can’t be much of a picnic. The main street is also decorated for the season, and various businesses around town do their part to make things festive. 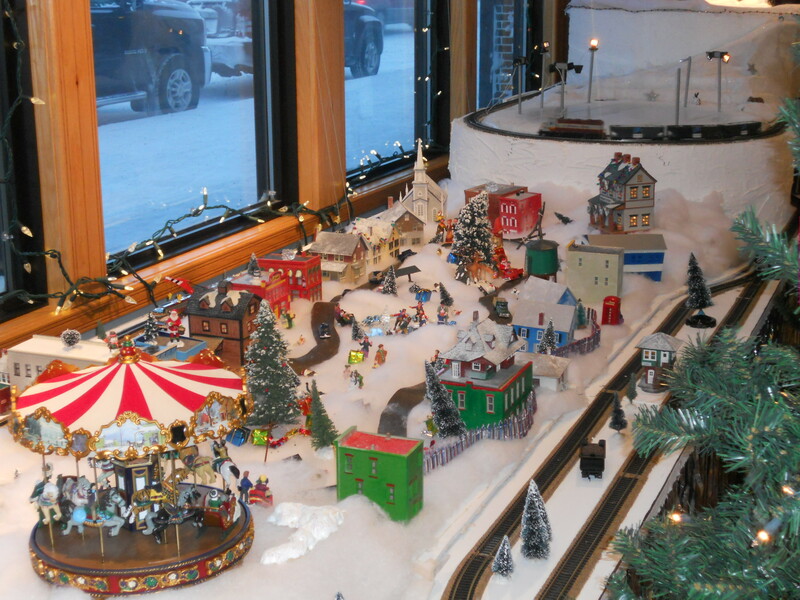 One of the diamond mines puts up a mini Christmas village, complete with a running train set. It’s hard to pass by their window and not stop to take a peek. It’s a huge display, so big that I could only capture it in sections. This is my favourite section. In the spirit of generosity that is associated with the season, there’s a moratorium on the feeding of parking meters. This is essentially to encourage citizens to patronize local businesses for our Christmas shopping. This year, we received the free parking benefit from December 20th to January 1st. If you didn’t know about it, of course the meters would still happily accept your money. For those folks without cars (of which there are lots) public transit is also free, from December 23rd to January 3rd. Yellowknife is easy enough to get around on foot if you live in town. You can walk to most of your destinations within 10 to 20 minutes. But when it’s cold enough, it’s very tempting to take the car, or a taxi, or to postpone errands altogether, to avoid even a 10-minute walk. 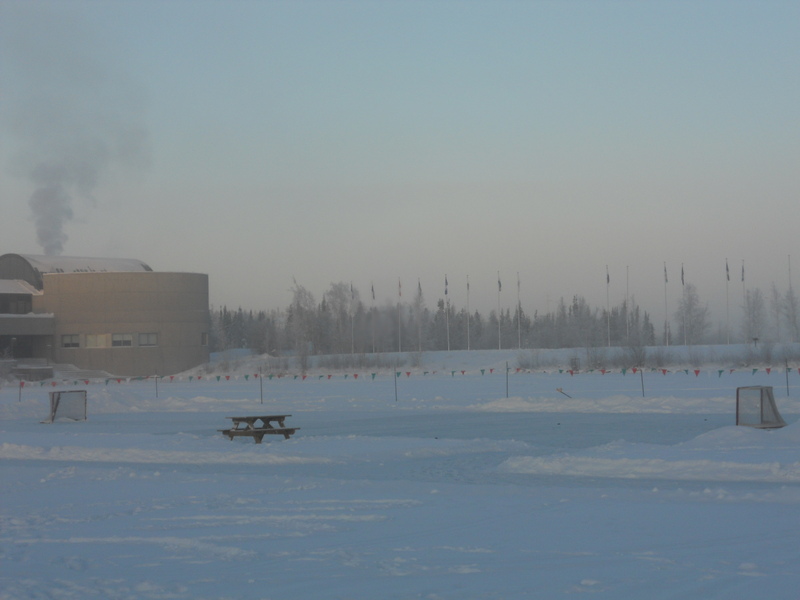 This year, temperatures in the -40s Celsius began in early December, accompanied by ice fog, to add insult to injury. It was as if Mother Nature just couldn’t wait for the winter solstice to begin her huffing and puffing. This is my 3rd Yellowknife winter and frankly, I think that from December to March, the sign that says “Welcome to Yellowknife” should be exchanged for one that says “Welcome to winter”. When the temperature is -40C and the wind chill makes it feel like -50C, and there’s ice fog to boot, you can barely see where you are anyway, and you’re likely too cold to care. People who don’t live here sometimes question me when I say that the temperature is in the -40s without factoring in the wind chill. For the non-believers, here’s evidence that I’m not making things up. This is why I’m thrilled when we hit a relatively warm spell in the high -20s or low -30s, which appears to be coming in the new year. Such frigid, ice-foggy days have been more frequent this month than I remember for all of last winter. This has become a typical day this month: wake up, look outside, see foggy darkness, the kind of eerie scene that would be the perfect setting for a movie about zombies, or Jack the Ripper. (Menacing, possessed ravens might be more appropriate for a Yellowknife setting.) Check the weather report, which confirms that the temperature is -40 something, there are ice crystals in the air, but there’s hope: it will be a sunny day. Watch hopefully as the sun struggles to come up around 10am, makes a weak attempt to burn off the fog, and fails miserably. By 1pm it still isn’t very high in the sky, but it’s there, and around 3 o’clock it gives up and starts heading back to bed. (I could happily adopt that kind of work schedule myself) Since it doesn’t rise above the tall buildings, downtown looks quite grey and foggy on those days. Here’s what happens to your face when you expose it in those conditions. 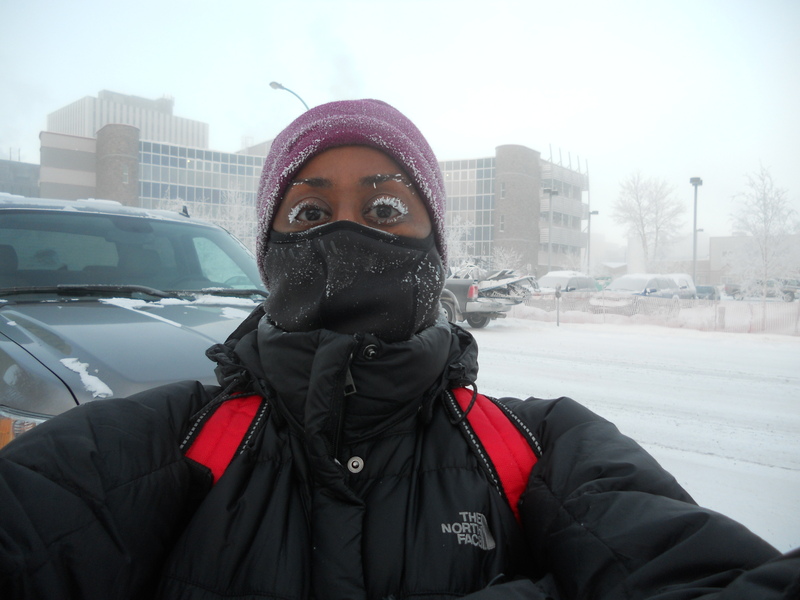 It looks worse than it is; my eyes don’t feel cold at all. December is also the month when the ice road opens, as do the skating rink and hockey rink at City Hall. Granted, sometimes it’s too cold to skate or play hockey, but the rinks are there, even if the people are not. 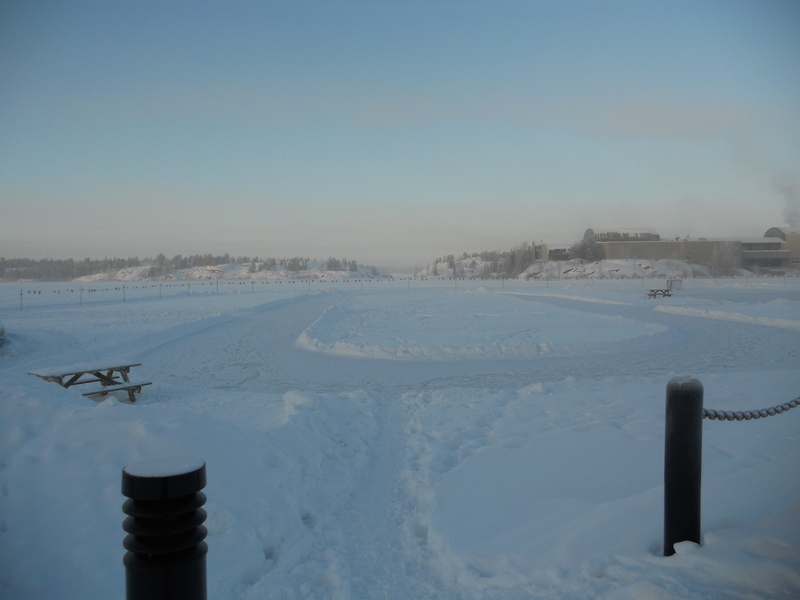 Never fear, the hardy citizens of Yellowknife will come out to skate and play hockey…eventually. After the excitement over Christmas, there was the added excitement of a power cut this year, on December 29th, for about 3 hours. Power cuts occur all the time in Yellowknife, but not often for such a length of time. They’re definitely more tolerable during the summer than during the winter. In summertime, I simply get out my candles and I don’t worry about it. But when there’s no power in wintertime, I am reminded of how dependent we are on electricity for basic survival. Without a generator or a gas stove, I have no means of generating heat of any kind. I can’t even boil water to make some tea to warm my body. My car might be a source of heat, but if it’s really cold it won’t start without a block heater, and I have no way to run the block heater without power either. It’s a bit scary when I think about it, so I don’t think about it. I just put on another layer of clothing and hope that the power is restored before I start to freeze. 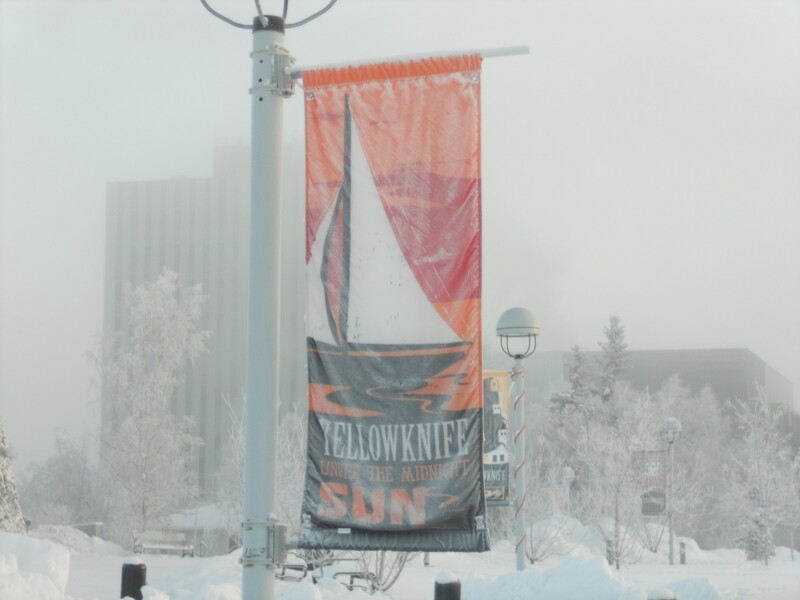 I feel like one of those banners around town that advertise the city of Yellowknife: frozen and shrouded in fog, but holding on to images of sunny summer days. The power’s long been back on, but completely unrelated, although equally inconvenient, the heating at home has been working in only some rooms. So I’m writing this month’s blog wearing multiple layers and with a hot water bottle on my lap. This is the second month in a row of too much excitement on blog-deadline day, which I can do without. Last month, I wrote my blog at a coffee shop, because it took a few days to get a new internet hookup at home. Every month I have no idea what I’m going to write about, but somehow, I figure it out on the last day of the month, when I have no choice. So there I was at the coffee shop on the evening of November 30th, with blog finally drafted and trying to upload the last photo. With all of the other people also taking advantage of the free internet, it wasn’t uploading very fast. Then, to my horror, the fire alarm sounded, and we were told that we had to leave. There was no way that I was going to be standing around in the cold, waiting for God-knows-how-long for all the floors to be checked before the all-clear could be issued, to come back in and finish. I simply had to get that picture uploaded and post that blog before I left. I didn’t smell any smoke and the coffee shop was on the ground floor of the building, so I figured I had time. Suffice it to say that I was the last person to leave the coffee shop. The staff were glaring at me but my eyes were on the upload progress bar as I gathered my things, and I hit the Post button as I lingered near the door to pick up the last of the wireless signal. When the fire brigade arrived, I was the only person still in the foyer. But I left, happy in the knowledge that my blog was posted and vowing that I would not wait until the last day next month. Tonight, I will go to bed happy in the knowledge that although I waited until the last day again, my cold fingers managed to get the job done. But really, I had to wait until the last day this month, because I wanted to post pictures of the New Year’s Eve fireworks at City Hall. Regardless of the temperature, Yellowknifers will come out to attend outdoor civic events and other activities, and tonight was no exception. The temperature was -43, with the wind it was -52, but there was a decent crowd, including lots of kids, who oohed and aahed at the display in the sky. Unfortunately it was foggy again so the pictures were speckled with ice crystals. Once again, it was way too cold for uncovered fingers to play with camera settings. So you’ll have to take my word for it again, that it was a good show. It was also a fitting way to welcome a new year: with lots of light. Something tells me that 2014 will be a very good year. Happy New Year!